A window cornice will add visual height to the wall while also visually bringing down the high ceiling. I can use small scale curtain rods I already have. 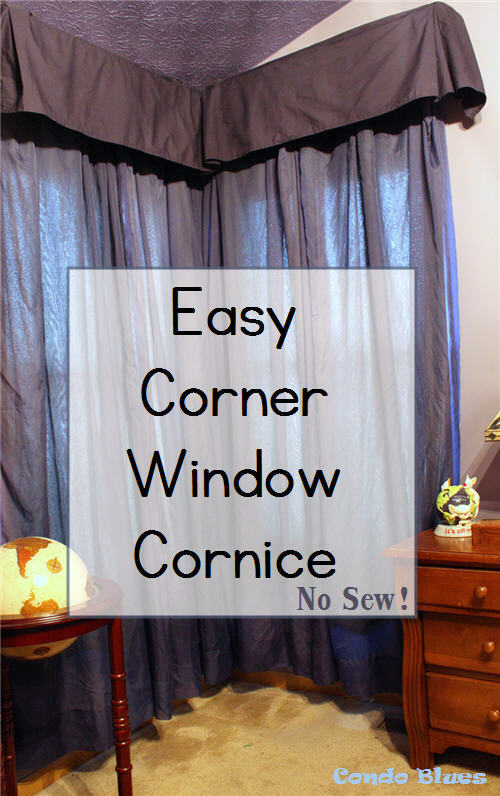 I don't need to buy new curtain rods that meet in the corner or need to have a custom corner window curtain rod made or cut to order. I can hang off the shelf curtains lower on the wall and just touching the floor so they look like custom length curtains. The cornice hides the curtain rod and hardware. 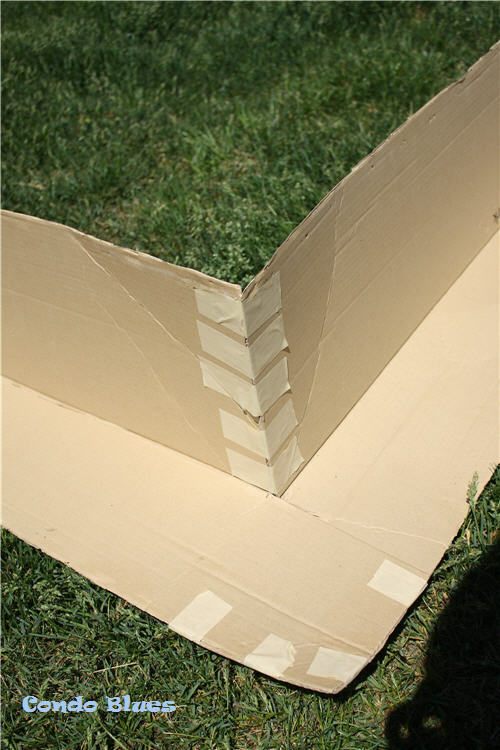 I can make a lightweight custom window corner for practically nothing because I am using cardboard boxes to build it. It’s a no sew project. 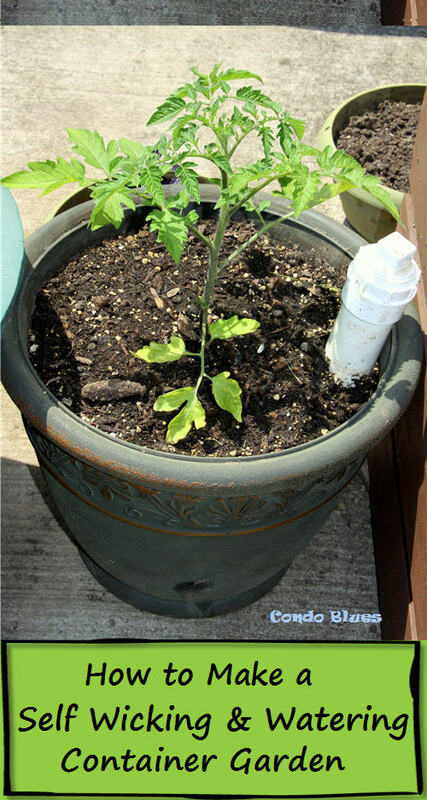 If you can use a stapler, you can make this project! I’m writing this tutorial a little differently because I am reverse engineering this project. 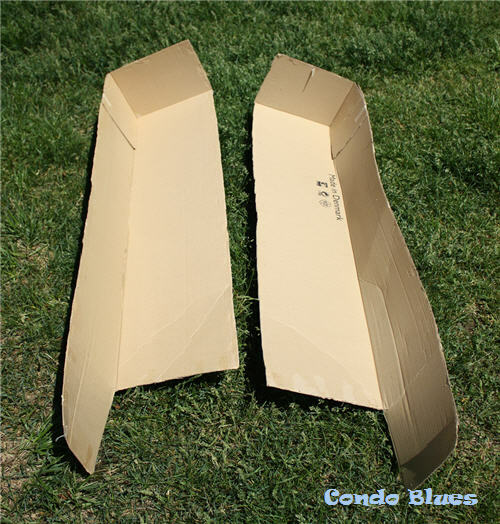 I built my no sew corner cornice shortly after we bought our condo and many years before I started blogging. The only reason I’m taking the cornice down is on my allergist's recommendation to make the master bedroom a Dust Free Zone. Boo, hiss. I really like the look of this corner cornice. Padding - Felt, fleece, or batting if you want it fluffy – It is OK to use mismatched scraps as long as they are the same type and thickness. No one will see the padding when the project is finished. Dust ruffle – I hate sewing box pleats. They are so fiddly! I bought and cut a King size dust ruffle that had box pleats. 1. I used the tape measure to determine how tall, long, and deep I wanted each side of of the corner window cornice to be. My cornices are 9 inches wide and 8 inches deep. 2. I drew cut lines for the length, depth, and width onto the boxes before I cut them. My plan was to cut the boxes on the sides so the corners of the each box makes the top, front, and outside pieces for each valance. 3. I added an approximately 8 inch overhang to the top of each window valance where each valance will meet in corner of the room. This is what I will use to attach the cornices together so they meet in the corner. 4. 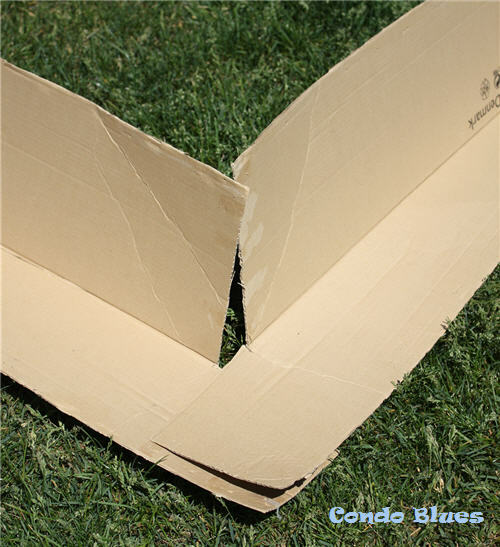 I followed and cut each valance out according to the lines I drew on each box. 5. I did a dry fit to check if the valances fit together in the corner when the top tabs over lap. 6. I taped the valances together at the corner with heavy duty tape and reinforced the joins with a heavy duty staple gun as needed. 7. 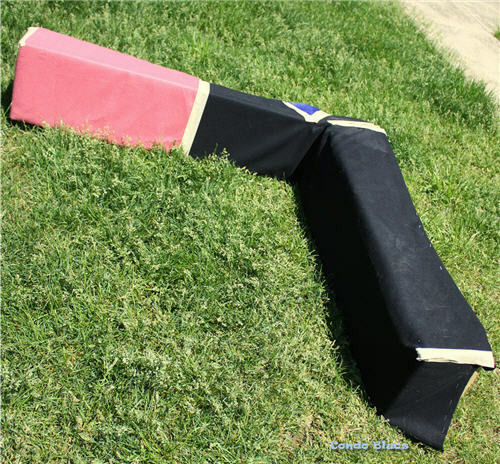 I padded the valance in felt and used a heavy duty staple gun to staple the felt into place. I wrapped the corners like a present and stapled them into place. I used several large pieces of felt from my fabric stash for this step. 8. 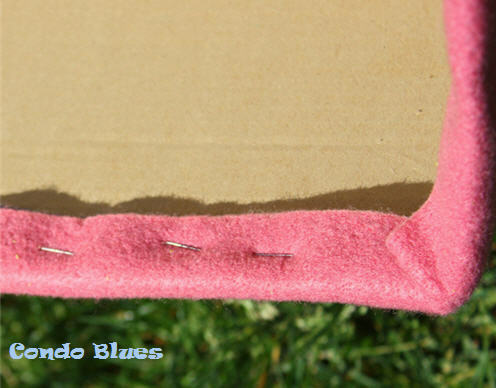 I covered the seam where two pieces of felt meet to make a smooth foundation for the fabric valance. 9. I put the bed dust ruffle on the cornice and arranged it so the knife pleats in the dust ruffle are in the corner and each end of the corner cornice. 11. I used the level, drill, and screwdriver to install the wall anchors and L brackets above each window. 12. I lifted the cornice into the L brackets. I attached the cornice to the underside of the cardboard window cornice to the L bracket with screws. I shouldn’t have been concerned about the cornice moving or falling off the L bracket over time. It stayed the way I made them for 10 years! 13. I used the level, drill, and screwdriver to install the wall anchors and curtain rod brackets. 14. 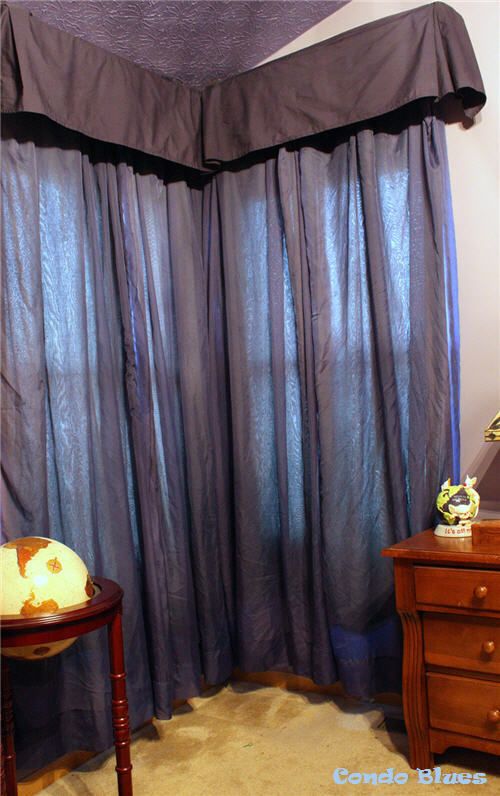 Lastly, I put the curtains on the rods. Ta da! Finished!